Do you dream of selling online with your own store and starting a profitable online business? Since you are reading this question, so I think the answer is yes. Big companies always have many options, but how to create a successful online store for startups and small business? Let’s answer these question step by step in the guide below. Build an eCommerce website is not a hard task with a ton of popular eCommerce Platforms & website builder, many of them are easy to use and Mobile-Friendly, such as Shopify, BigCommerce, Webflow eCommerce, Volusion, magento and WooCommerce+Wordpress. They can offer all you need to manage your online store. Due to these powerful eCommerce Platforms and Solutions, starting an online business today has never been easier. You may have decided to open your dream online clothing store, setting up a drop shipping business or just want to sell digital products online. However, it would be difficult for beginners to know where to start! Luckily, the best news is that we’ll share our experience in building online stores with you without reservation. 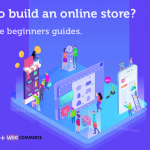 After reading this guide, you can choose the right eCommerce website builder for your online shop, and at the same time it will grow your online business fast. I. First things first, we need to talk about 6 point checklist before you start building an online eCommerce site. II. Secondly, we will talk about how to choose the best Ecommerce Platforms to build your online store. III. Then, we will take an in-depth look at the features&functions of of best online eCommerce Store Builders – Shopify. IV. Finally, we will follow the Complete Steps to make a self-hosted professional online store from scratch on the web(WooCommerce). Now, I will show you how to do it. Are you ready? Let’s jump right in! 1.2 Select Products Sourcing According To Your Online Store Business Model. 1.3 Tips To Choose A Good Domain Name For Your eCommerce Website. Chapter III. 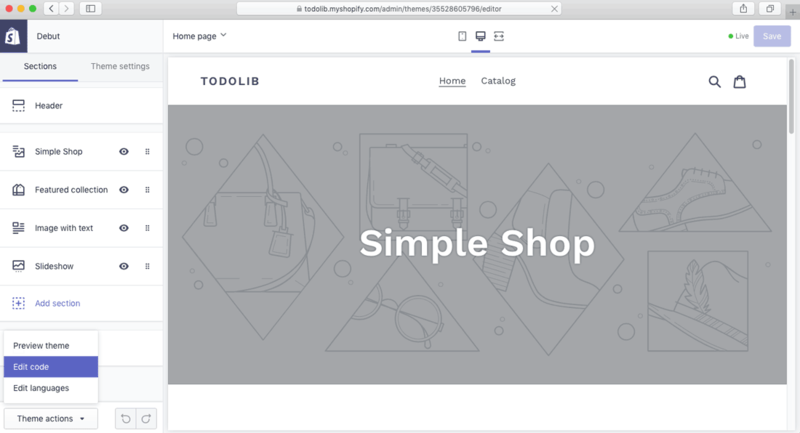 Tutorial For Beginners: How To Set Up A Shopify Store Step By Step. Which eCommerce Platform You Should Choose( WooCommerce vs. Shopify)? Chapter I. Tips before you start Building your eCommerce online store. This Guide is intended to provide you with sufficient information to help you select the best eCommerce solution and make a business plan. Regardless of the eCommerce website Builder you choose for your online store setup, running a business is no easy task, take a look at some helpful tips, and you should know these 6 Important Points about selling online before getting started. 1.1 Keep in mind, before you do anything, it’s very important to decide what types of Products you want to sell in your online web store. Sell physical products, like electronics, pet food, clothes, shoes, etc. Sell online service. if you are a freelance designer, for instance, you can provide service like Graphic Design, Logos design, Web Design(templates&themes) and Brand Identity. Sell digital products. such as ebooks, tutorials, digital art, graphics&photography, software, mobile apps, music, web themes and more. 1.2 Select products sourcing according to your online store business model. Coming up with unique products can be difficult, find products your target audience are passionate about. DIY products & services- If you want to be self-sufficient in your home. Try dropshipping to fulfill your store’s orders, if you don’t plan to keep products in stock. Sourcing your product from online Suppliers: Alibaba, Aliexpress, Globalsources. You should consider offline products sources too, so work with local manufacturers and wholesalers. Pick a unique store name for your domain keyword, short and easy to remember for your target audience. Your domain name should perfectly identify your brand. Avoid using a shared domain(sub-domain) for your eCommerce website, like “mystore.domain.com”, it’s not a good idea to run your online business long-term. 1.4 Customizing and Designing Your online eCommerce store. 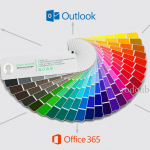 so you have to choose an user-friendly template or theme for your online store. you can also purchase one premium theme that design by professional designer from third-party web design marketplaces. If you have a big budget, perhaps the best choice is hiring a freelance designer to customize your eCommerce store’s appearance. 1.5 Select the right&best eCommerce website builder or e-commerce platforms for your online businesses. Get on their forum, check out their blog and take a peek at their support materials. Finding a platform with a great community of people both running it and using it who will testify to their success on the solution. “Right” means low cost to entry and easy to scale. In addition, there is no costly development and technical hassle. Sign up for a free trial to test its features and functions of the website builder before checkout. The cost of moving on different eCommerce platforms is very high. Finding a eCommerce framework which can scale along with your growing you online businesses. “Best” means the ecommerce platform you choose is best match your individual needs and fit your specific online business better. 1.6 Market your online business. Once you have created an eCommerce store, you have to promote it to target consumers. Paid advertising(like Google AdWords, Facebook Ads, Bing ads, etc) is often the fastest way to drive traffic to your eCommerce store. Consider publishing products tutorials&reviews articles in your personal blog, then add Links to your store page. or you can Submit Guest Posts to product reviews blogs. Promote your products with Affiliate marketing, a Referral Program will bring you new customers and Grow Your Sales. Try to promote your eCommerce store With Email Marketing(Mailchimp, Sendgrid, Optinmonster), building an email list, offer your newsletters an new or favorite product preview, this will keep them coming back again and increase your brand recognition. Promote Your Product On Social Media, you should consider Social Media(Twitter, Facebook, Youtube, Pinterest, Instagram) as an important way to promote your brand and increase your sales. Promote Your Online Store Offline, If your Selling Product on the home front, Publish Your store Ads in local Newspapers, TV, and Magazines. or you can hand out Printed brochures&Flyers with discount codes or coupons During the Holidays. Sometimes “old” method works very well. Chapter II. Choose the best Ecommerce Platforms to build your online store. So, Which one is the best Ecommerce Platforms to build a online store? Before we go next, let’s take a look at google trends! Shopify is pretty the most popular and best online eCommerce website builder&platforms for small business today. Its all-in-one eCommerce solution make sell products worldwide much easier than before. 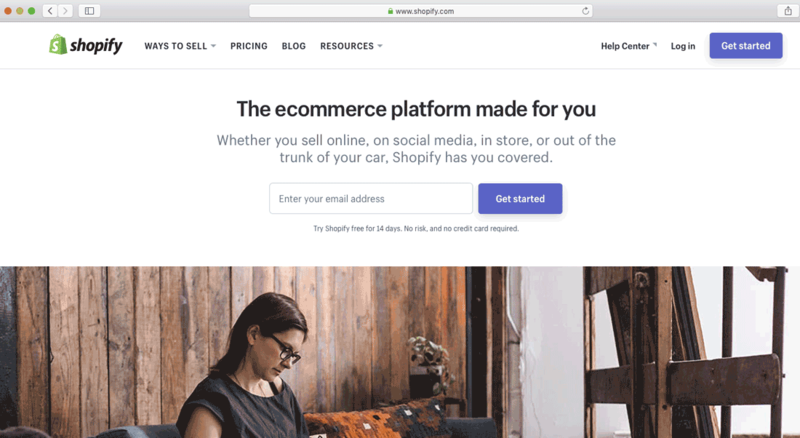 Before we start building online store, let’s talk about the main pros and cons that we think you should know about Shopify, then we will create a Shopify eCommerce store Step-By-Step. ✔ Easily Build An Online Store With Shopify, No design skills or any other special technical experience needed. 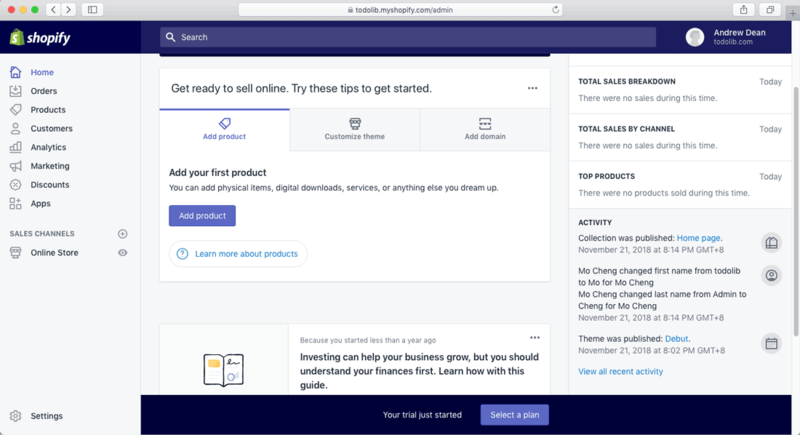 ✔ Out of the box, Shopify already offers everything in one place you might need to sell online with your own store. ✔ Fully customizable store website, in addition to 100+ professional storefront themes(free and premium), you can also customize every aspect of your online store by editing its HTML and CSS. ✔ Mobile ready and Marketing & SEO Friendly, a range of built-in functionality and online marketing tools. Shopify online shop includes a built-in mobile shopping cart. Plus you can sell products with Shopify on Facebook directly through a “Buy button”. ✔ Shopify provides plenty of Ecommerce Apps(add-ons) and free tools to run your online business:Logo maker, Business name generator and more. ✔ Shopify POS(Point of Sale) app let you selling anywhere. ✔ You can publish articles with Shopify built-in blog. 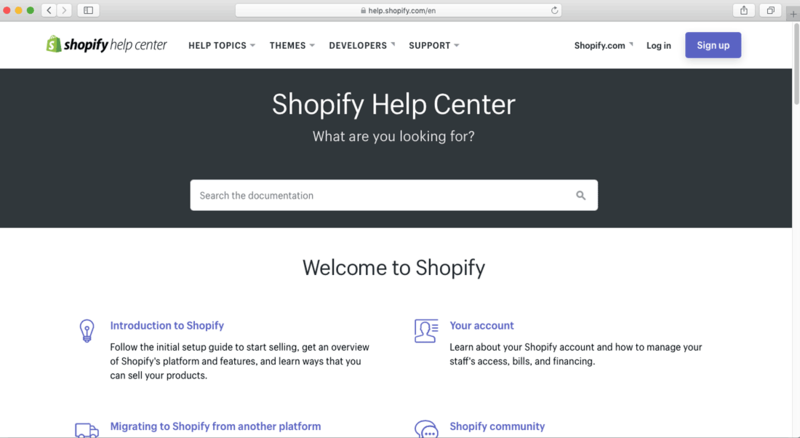 ✔ Extensive self-help Documentation, Shopify offers a comprehensive documentation for beginners, in “Shopify Help Center” you can get all the answers you are looking for. ✖ Costs and fees:like all the other eCommerce store builders, Shopify’s fee is more expensive than a self-hosting store(magento and WooCommerce+Wordpress, etc). You have to pay for monthly fees, app(add-on) and theme fees(most of them are not free), transaction processing fees, even though you have very few orders per month. ✖ The Shopify Lite plan ($9 per month) is not enough allow you to build a fully functional online store. ✖ Some features are limited unless you upgrade advanced plan, like “professional reports” and “advanced report builder” are only provided on more expensive plans. 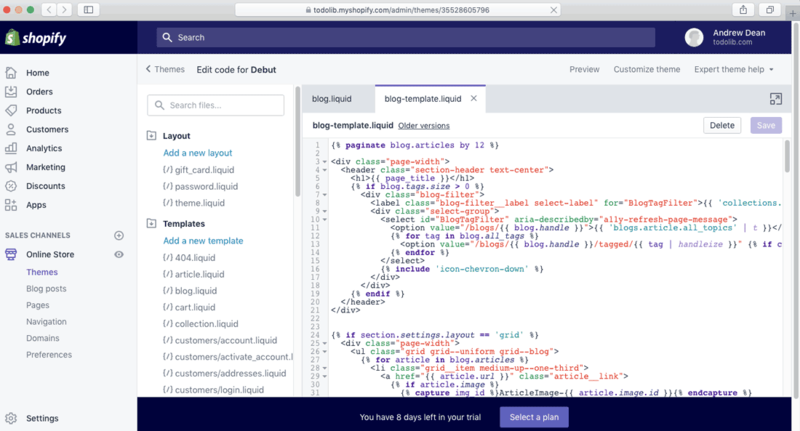 ✖ Uniquely codes:Shopify uses a templating language called “Liquid”, that means you may need to hire a web designer if you want to customize a store template. ✖ Because of the product images on Shopify store can’t be displayed with the same aspect ratio, so you have to crop images before uploading them to you online store. ✖ Exporting blog posts to other blog platforms are not easy. ✖ Shopify is not an open source eCommerce Platform, it means customizing an advanced functionality to scale your online store with you own support team is not hassle-free. WooCommerce is a free eCommerce store plugin built for WordPress, it allows you open an online store and sell anything you want, physical products, digital products, as well as affiliated products. According to BuiltWith, WooCommerce Checkout is currently the most popular solution in eCommerce category. Thanks to its active community of developers and experts, WooCommerce becomes more and more powerful, highly customizable, and easy to use. This best open source ecommerce platform will help you run a successful eCommerce website to start and grow your online businesses. ✔ 100% FREE, WooCommerce&WordPress are open source software, you don’t need to pay anything. ✔ Easy to use, benefit from its widely used and large community support, you can find the right answer easily when you run into a problem with you online store. ✔ Highly Customizable & Flexible, there are a lot of free WooCommerce plugins and WordPress themes(free & paid) you can choose, that allow you to design your online store for individual needs. ✔ You actually have control over your store, the data was stored inside your WordPress database, you can Import/Export or migrate your data at any time. ✔ The setup is easy and fast, you only need to do a little work, without any complicated configuration, your eCommerce site is running and ready to sell! ✔ Easily scalable, you can customize your online store however you like, by adding advanced functionality and features. ✖ Not out of the box, it requires a bit of technical knowledge in WordPress. ✖ Maintenance and updates, for a self-hosted online website, once your store is running, you have to handle updates and maintenance yourself, or you may need to hire a web developer to do this. ✖ Due to the frequency of WordPress updates, WooCommerce don’t always work very well. ✖ Costs: Even WooCommerce is free, but you’ll have to pay some obligatory fees, like VPS&hosting, premium themes&plugins, hire experts for development, customization, maintenance, etc. OK, It’s time to choose your own ecommerce website builder and launch your online store now! Step 1: Create an Account for Shopify. Visit Shopify.com and click on ‘Get Started‘ button, enter your email address, password and store name, click on ‘Create your store‘ button. 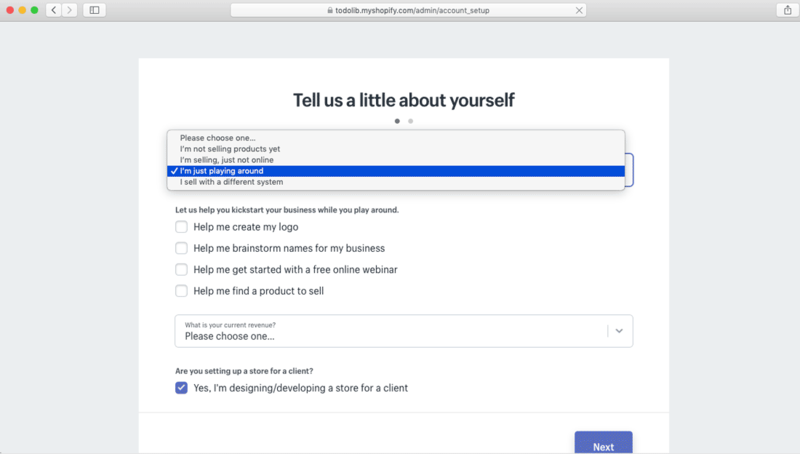 Step 2: Shopify ask you about the things you aim to, some help options for kickstart your business, so pick the right option for yourself and click ‘Next‘. 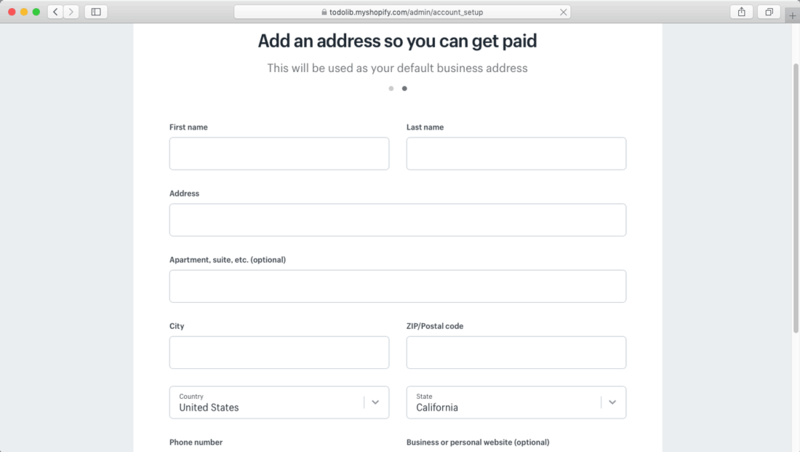 Step 3: Fill in your personal information here, so Shopify can configure payments and tax rates, then click ‘Enter my store‘. 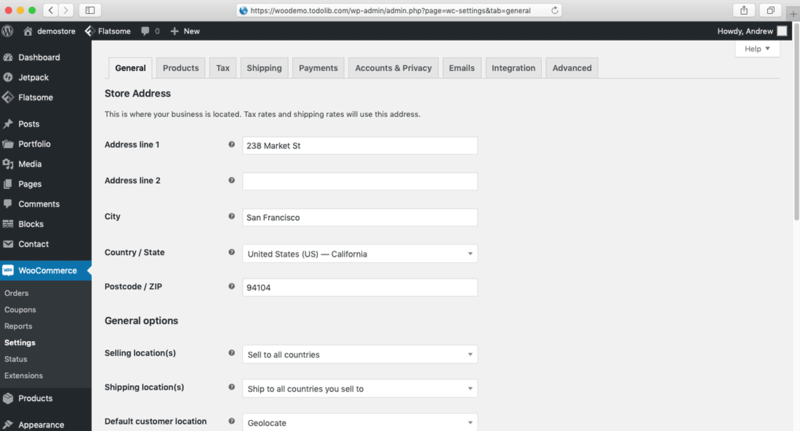 Step 4: Choose a Theme to customize the look of your Shopify online store, in admin dashboard click ‘Customize theme‘. 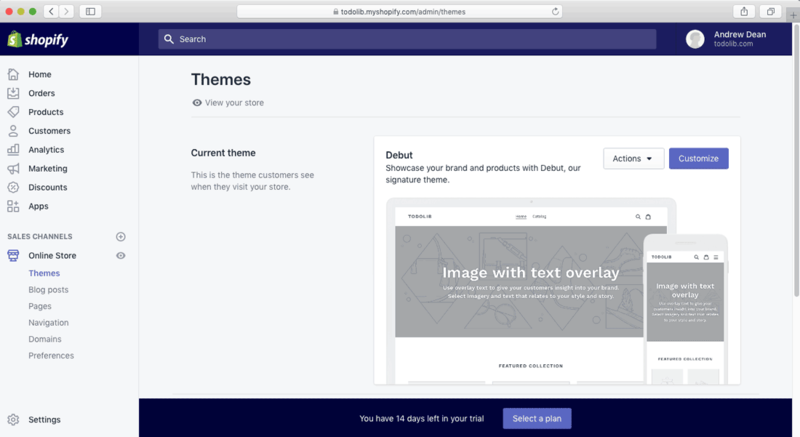 At theme panel you can create a custom layout in your theme, upload theme, you can also choose a new theme(free and paid) from Shopify theme store or themeforest. And what’s more, you can edit your current theme code. Step 5: Add a custom domain to your eCommerce store, at domain panel you can Connect existing domain, Transfer domain and Buy new domain, by default, your Primary domain will use a sub-domain like ‘todolib.myshopify.com‘. Step 6: Setup and manage your online store’s payment, Click on the tab to the left of the admin dashboard called Settings. Next, at Settings panel click ‘Payment providers‘, then you can choose a payment provider to accept payments for your store’s orders. 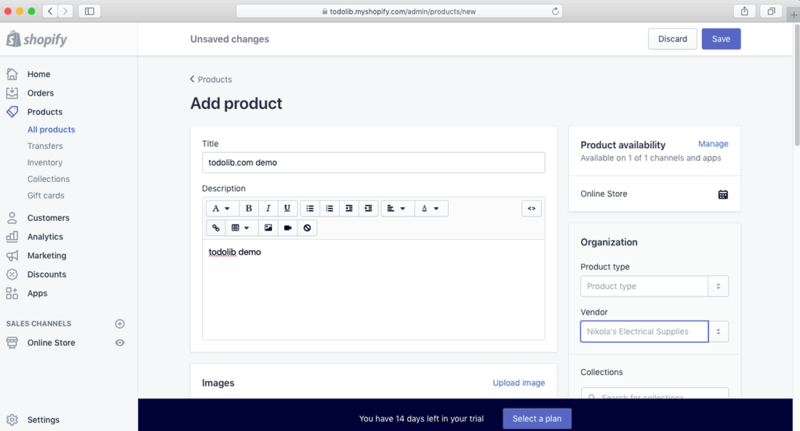 Step 7: Add Products to Your online Store, in you Shopify store admin dashboard, click on ‘Add product‘ button to add your first product. At products panel, complete details of your product page, like title, description,images, product type, Pricing and Shipping, etc. 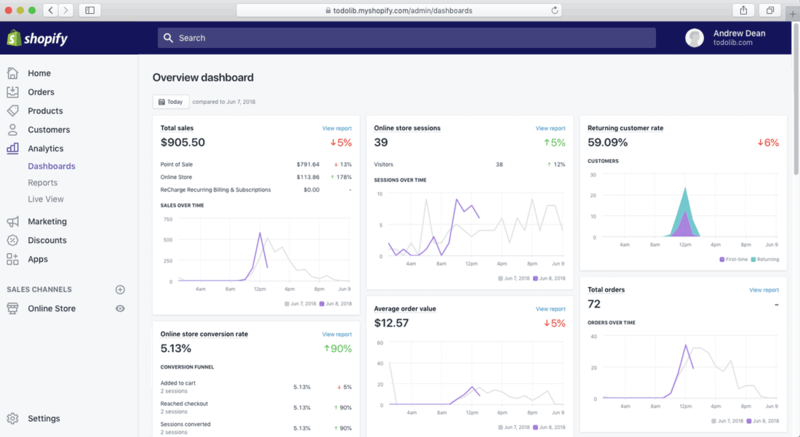 Step 8: Use Shopify analytics to analyze your store’s transactions, go to Analytics > Dashboards, the ‘Overview dashboard‘ shows key sales, orders, and your store visitor data. 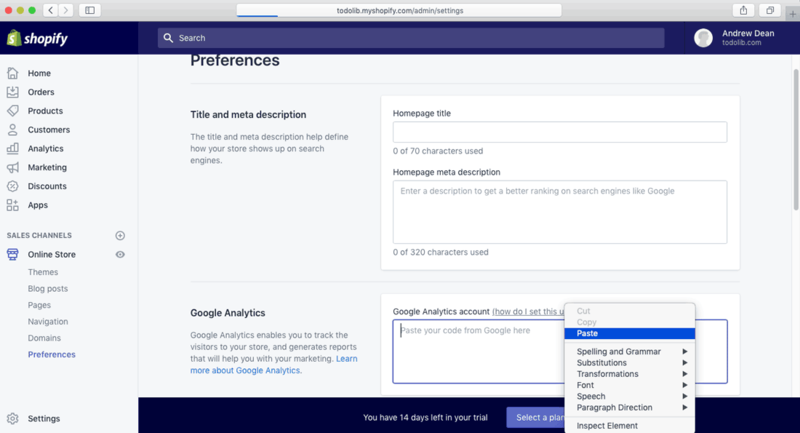 Step 9(Optional): Add Google Analytics to shopify eCommerce store, go to Online store> Preferences, paste your Google Analytics Code into text box. Step 10: When you have trouble with your online store, you should consider finding the answer in “Shopify Help Center” first. Learn more about:How to create an online Shopify store from scratch(Free tutorial video)? You can start your own online store using WordPress and WooCommerce plugin, it’s easy! The goal of creating of this guide was to help those who have experience in building website or may just want to challenge theirself. Hosting your own ecommerce online shopping website with VPS&Dedicated servers gives you more control over the shop and its presentation, is better for business branding, makes moving to another web host easier, and can be more cost-effective. 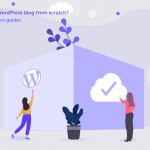 Before we get started, learn more about: How to Create and Start a WordPress Blog From Scratch? 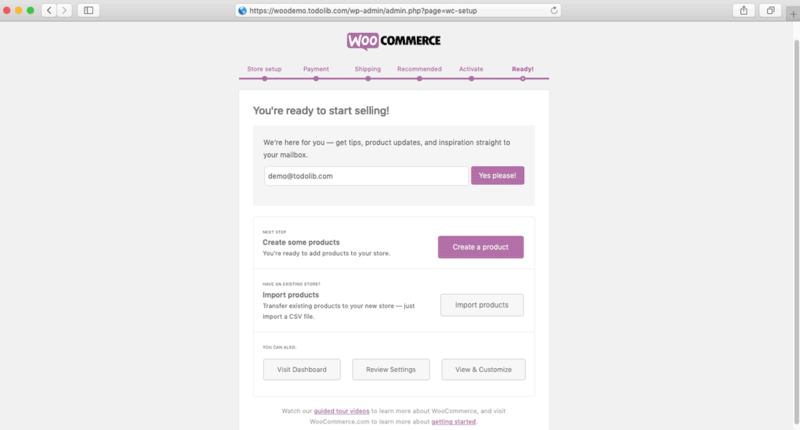 Step 1: Install and Activate the WooCommerce Plugin in your WordPress Admin Dashboard. Once your WordPress installation complete, head to [yourdomain.com/wp-admin] and log into the WP admin panel. Click on the ‘Plugins‘ on the left of your WP Admin Dashboard, then select [Plugins > Add New] button. On the [Add Plugins] page, search for the keyword ‘Woocommerce‘, Then click on [Install Now] button, the Woocommerce plugin should be installed shortly, After that, just ‘Activate‘ it. How to Install Woocommerce Plugin Manually? 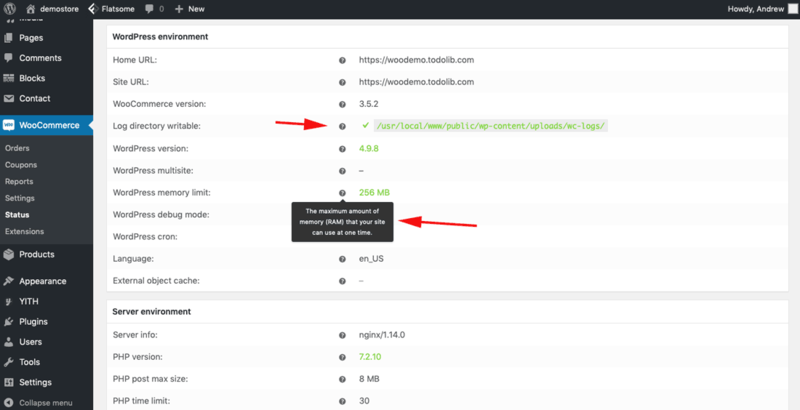 You can download it from the WordPress Plugins page, on the [Add Plugins] page, click on [Upload Plugin] button, and browse to the Woocommerce plugin zip archive and select it, click [Install Now], it will be okay soon. After you had activated WooCommerce plugin, you will be redirected to the Setup Wizard page, you can rerun the Setup Wizard from [WooCommerce>Help>Setup wizard] or go to [yourdomain.com/wp-admin/admin.php?page=wc-setup]. 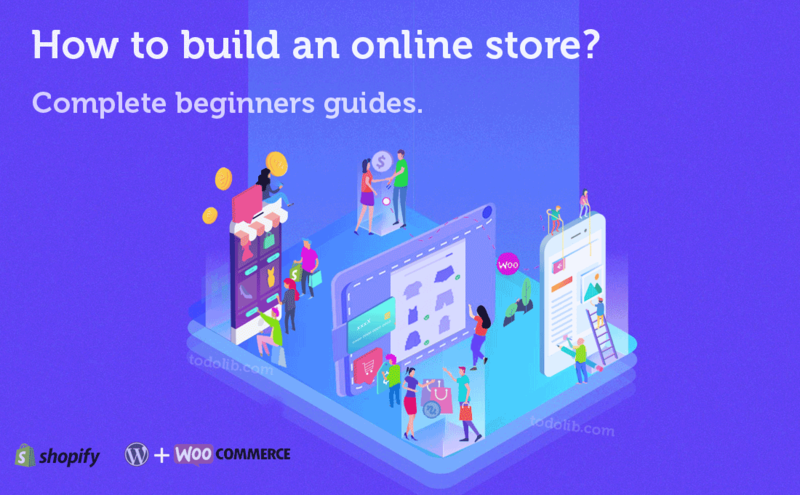 The WooCommerce Setup Wizard will helps you through all necessary steps to build your online store and get it ready to sell! On the first page, you need set the location, address and currency of your ecommerce store, the type of products you plan to sell, and whether you sell products and services in person. 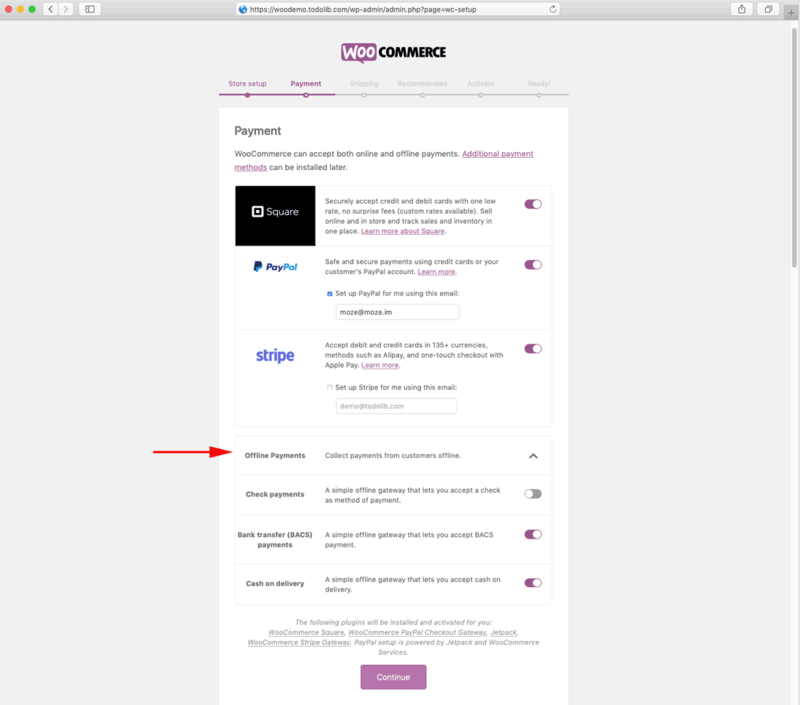 On the second page, you can choose Online Payment(Paypal, square, stripe) and Offline Payment(Check, Bank transfer, Cash on delivery). On the third page, set up your shipping and choose a unit of measurement for weight and dimensions. On the fourth page, some recommended theme and plugins will be installed when you select them, like default WooCommerce theme(Storefront theme), automated taxes(Jetpack pllugin), MailChimp plugin. On the fifth page, If you selected automated taxes in the previous step, you need to make a connection with Jetpack. if not, just ‘Skip this step‘. 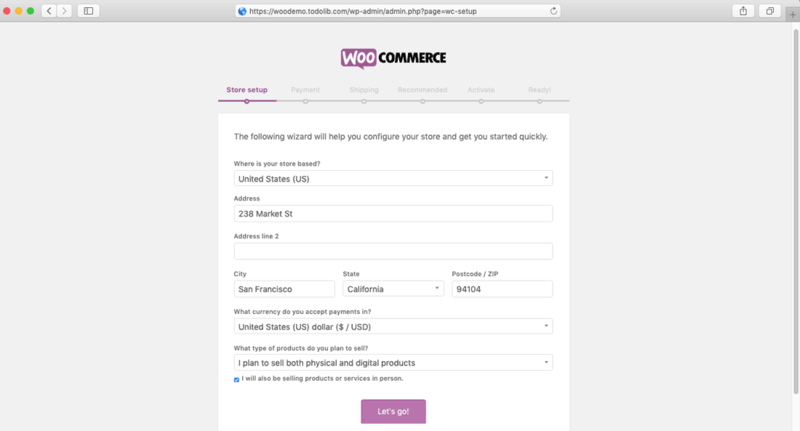 On the last page, your WooCommerce setup Wizard is complete, you can create your first product or do something else. 🔔 Pro Tip: You can change all the options you had set before on [WooCommerce>settings]. 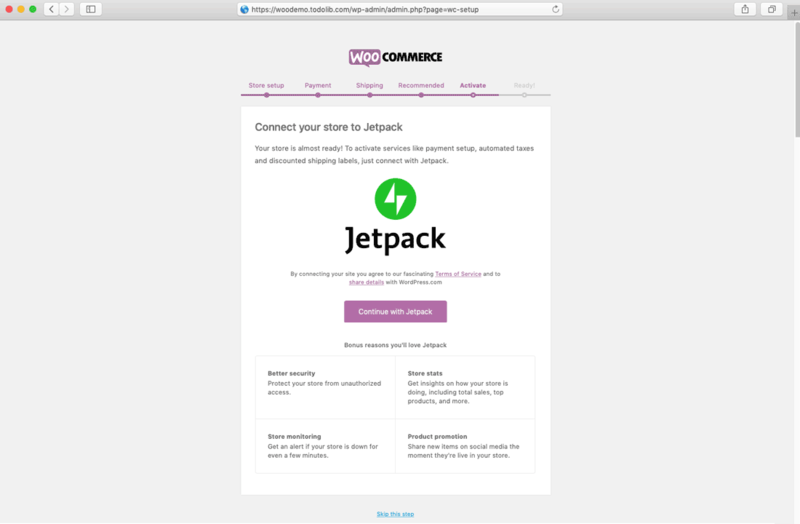 Go to [WooCommerce > Status] Page, in this section, you can get all information about your ecommerce site and the features you have enabled. When a feature was enable, you will get a ‘✔‘ and the information will be colored green(good), or you will get a ‘✖‘, and the information will be colored red(bad). You would most likely lose some important functionality if you got a ‘✖‘. As it happens, move your mouse pointer over ‘?‘, fix the issues according to the help-tips on it. 🔔 Pro Tip: Checking your WooCommerce system status carefully before going to the next step! Learn more about: What is the WooCommerce System Status Report? 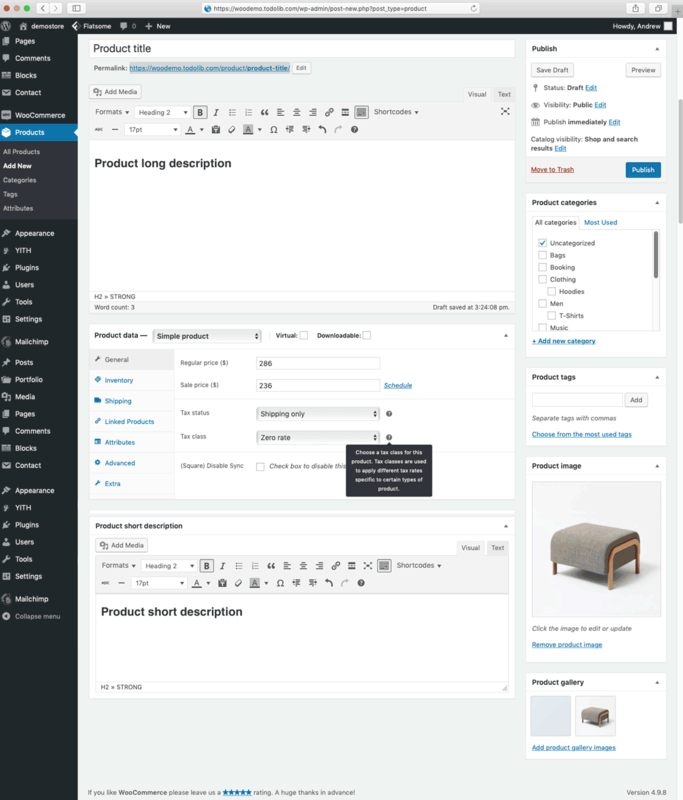 Go to: [WooCommerce > Products], click on the [Add New] button to add a product, then enter a title for your first product, along with additional details. Such as Price, Tax, Product Categories, Tags&Attributes, product description, Product Images&Galleries, and more. 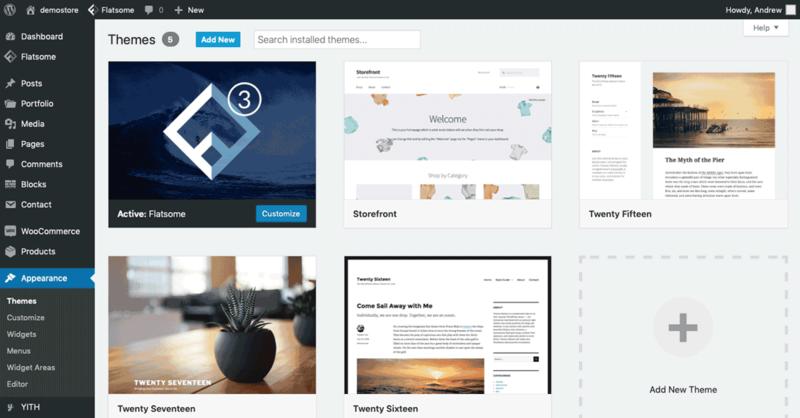 While WooCommerce offers a free official default theme, I suggest you use a professional Design WooCommerce theme for your eCommerce store to scale your online business. 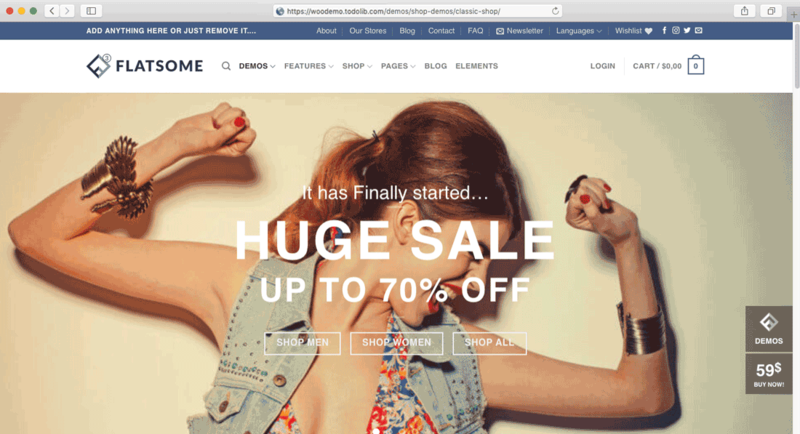 In this tutorial we choose flatsome – the best wordpress eCommerce theme on ThemeForest for our demo store. Visit [Appearance > Theme], click on [Add New] button. 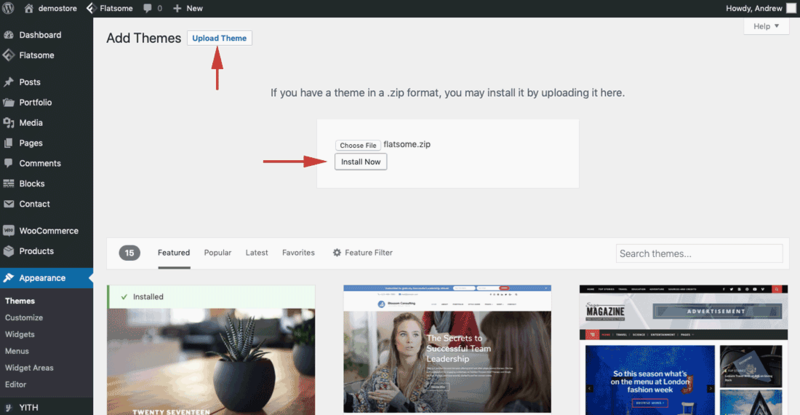 Next, click [Upload Theme] and select [Choose File] to choose the theme zip file, click on [Install Now] button, you can preview it or just hit [Activate] button to make it official. 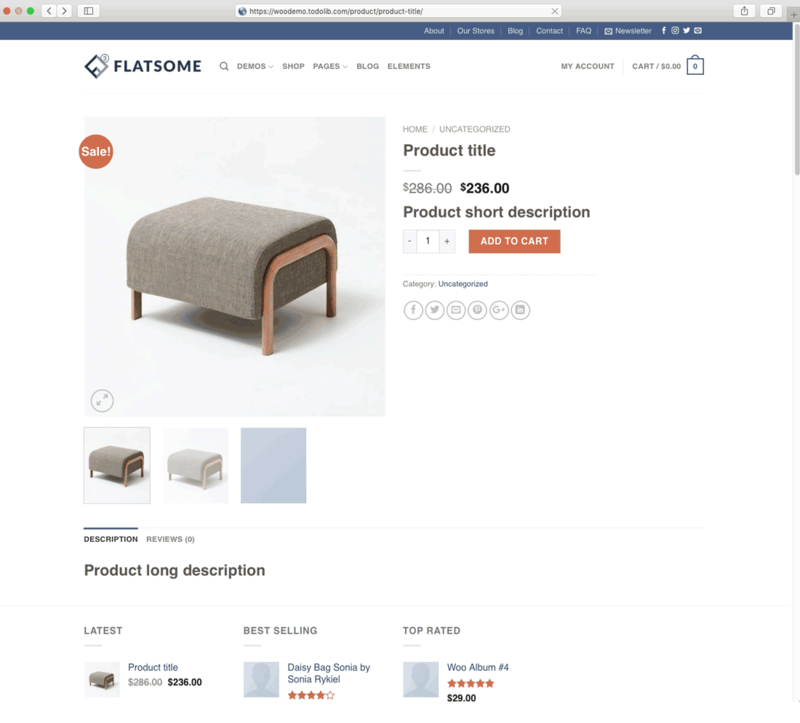 Learn more about:How to build an ecommerce website with the best WooCommerce WordPress theme -Flatsome? 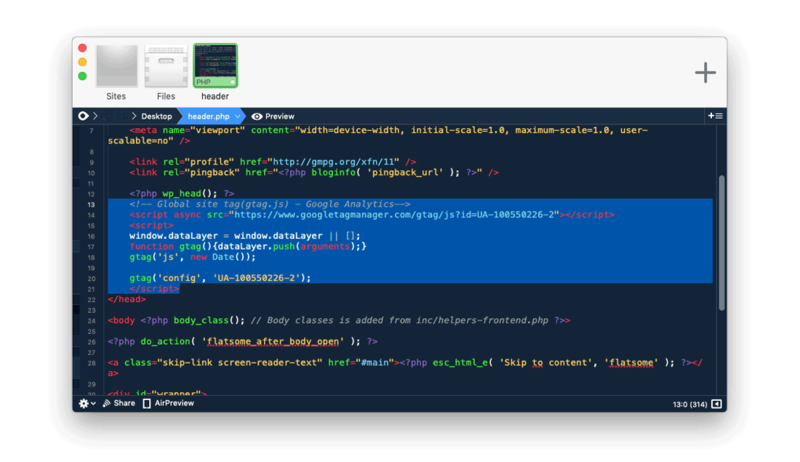 From your WordPress Admin Dashboard, go to [Appearance > Editor], on the right click on [Theme Header] header.php, and then Paste your Google Analytics code into the file before the HTML ‘</head>‘ tag, click on [Update File] button to save it. 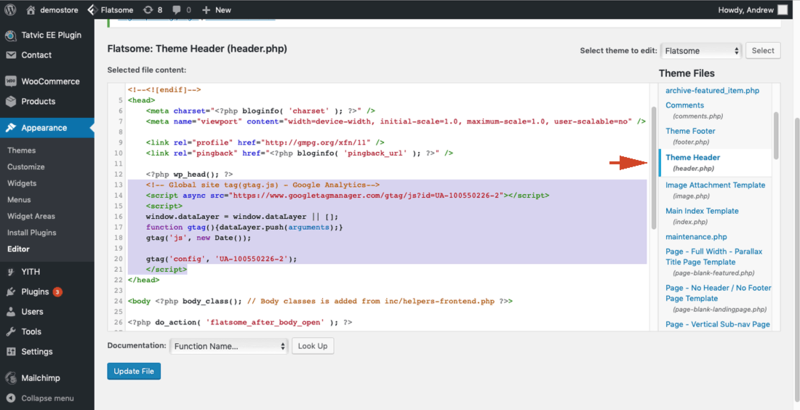 You can also edit theme header.php manually in you Mac or PC before uploading the zip file to your web hosting. 🔔 Pro Tip: Please ensure the enhanced eCommerce tracking is enabled in your Google Analytics account! 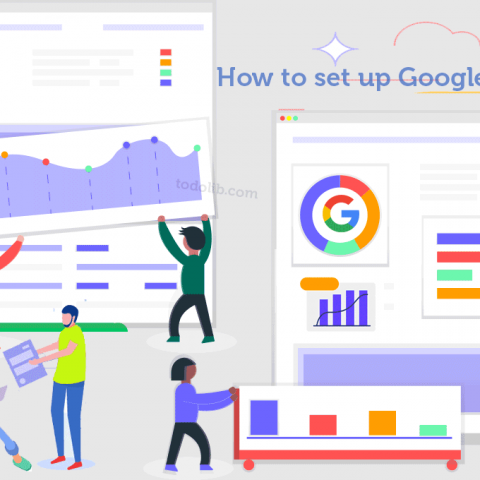 Learn more about: How to Add Google Analytics tracking code to eCommerce Store: Shopify and WooCommerce(WordPress)? Congratulations! You have successfully set up your own eCommerce online shop. Send Out Follow-Up Emails to your Subscribers and Current Customers by using Mailchimp for WooCommerce. Add High-Quality Product images and videos to Reduce Bounce Rate. Put one Thank-You Card Printed with letters that look handwritten into the Package when shipping it to your Customers. Create Clickable Email Signature include link of your store for yourself to increase awareness about your store’s brand. Optimize Your Website Speed by using CDN or Cache Plugins(W3 Total Cache and WP Rocket). Make the Checkout Process as simple as possible to reduce the percentage of your store’s visitors abandon their shopping carts. Add Social Share Buttons to you eCommerce store products pages, social Media is the most effective forms of marketing on the internet. Add a Live Chat Plugin for WooCommerce to your store to manage communications and interactions with your customers. Offer as Many Payment Options as Possible for your Customers to make them pay easily. Which eCommerce Platform You should choose to create your online store ( WooCommerce vs. Shopify)? If you want an out-of-the-box online store. If you want a highly customized online store. If you don’t care about any of the technical skills. If you have some technical and design experience, know-how to set up the store yourself. if you want 24/7 support, call at all times in case you have any questions. 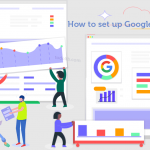 If you have a team to help you or you can figure things out with Google Search. If you don’t mind the official managed the data of your store. If you want to have much more control over your eCommerce website. If you want a official reliable team to maintain you eCommerce site. If you plan to handle maintenance yourself or hire an expert to do it for you. If you don’t mind having a monthly subscription. If you have only minimal budget and want to do everything on your own. Whether you set up you online store with WooCommerce or Shopify will depend on the budget and technical experience you have. If you have only minimal budget to start with your online business, you good at web designing and have knowledge of maintaining your eCommerce store, and want to get more freedom for your store, WooCommerce should be the best option. Otherwise, Shopify will probably be a good choice for you. When it comes to building an online store with best eCommerce Platforms & website builder, there are always so many topics we can talk about. But all of this is only a start for a successful eCommerce website, the important thing you should keep in mind is that you have to drive traffic and converting visitors into customers, then receive many orders and make a lot of money. Finding a eCommerce solution with functionality&features meet your needs. Time is money, so follow this guide above and start to get your hands dirty! It’s your turn now! Facing some hurdles? feel free to tell us in the comments below now! If someone replies to my comment, please SEND me a email.